RealXGear Cooling Technology is the result of years of research. The technology is a patent pending combination of durable, environmentally friendly materials. These materials work together to retain water and provide cooling while remaining dry to the touch. When the cooling stops, simply re-wet the item in water and wring it out. Within minutes, it’s cool again. 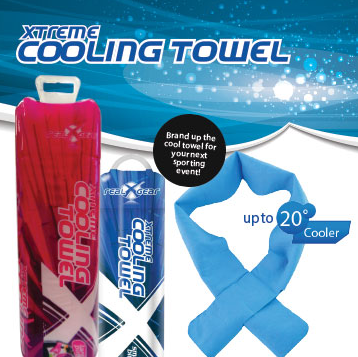 The Xtreme Cooling Towels are durable, machine washable and can be used hundreds of times. It also comes in it’s own storage container for convenience! The cool towels and collars are great promotional products for sporting events and fitness centres. With print area up to 60mm diameterdepending on logo design.